Eliphante is a place for inspiration, a place created by a unique and inspirational experience in the natural environment. People have often said that there’s no other place like it! Many have been filled with a renewed sense of enthusiasm for the natural world, seeing how we can creatively design our buildings artistically within in it. Eliphante caregivers and members contribute toward the repair and preservation of the sculptural buildings and growth of establishing a commercial museum. There are many tasks for willing hands and minds, and great need for technical and financial assistance; find out how you can help – Contact Us to get involved. Offering financial support to Eliphante is so amazingly appreciated!! The previous transition to Eliphante’s now self-held Land Title has been essential to the preservation efforts of Eliphante grounds, but really needs your support to take it’s next step and attain commercial status for public access and enjoyment! Cash donations or materials drop-offs can be made by appointment. If you have materials or goods that you would like to donate for a write-off, or just give to a good home, please get in touch with us! You can check out the Eliphante Wish List for all the various things we are actively seeking, but if it’s not there and you are still interested in giving, don’t hesitate to ask! This is a great way to make an impacts on our current projects! These materials and equipment help support the preservation and restoration of Eliphante. This land is preserved and sustained by visiting artists and involved members; outside of labor efforts is a need for materials, but, if it’s not listed and you are interested in giving something in particular, don’t hesitate to ask! Any contribution is always appreciated and valued donations may also be tax-deductible! Crusing through Sedona to Cornville, AZ to see the art complex called Eliphante, and on to the haunted hotel in Jerome. More travels on Route 66, thru Seligman and Kingman, then up to Chloride to see yard art by Sharon Gittings, and in Las Vegas, Dr. Lonnie’s vast collections at the House of Hammargren. Eliphante is a private residence and not open to the public. It is looked after by the non-profit 501(c)(3) organization Eliphante, Ltd, established in 1987 to preserve and restore the art and works of Michael Kahn and Leda Livant-Kahn. The artist Michael Kahn spent 30 years of his life creating, while painting and residing at, the three acres known as Eliphante. The buildings and structures at Eliphante, while expressions of creativity and artistry, were also Michael’s solutions to the practical needs for work space, studio’s, shelter and housing for himself and his wife Leda. Michael lived there until his death in 2007. Leda remained there until 2009, and now lives in Cottonwood AZ. Today, Eliphante Village is entering a new chapter focused on priorities of commercial zoning and building restoration to support the property, future gatherings and community-minded projects. The 800+ works of art comprising the Michael Kahn Collection, now housed in Santa Fe, New Mexico, are under the care and ownership of Peter Ader, Don Smalley, and Kahn’s widow, Leda Livant-Kahn. Other than the history, legacy, and countless warm memories, the Michael Kahn Collection of Paintings is distinct from Eliphante, Limited, so please visit MichaelKahnPaintings.com for more info. Subscribe to our General Newsletter! 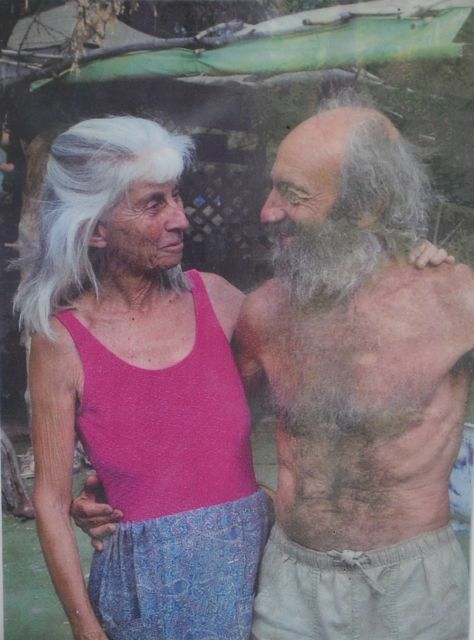 In the late 1970’s, Michael Kahn and Leda Levant, while living in Sedona, met a couple in Cornville who owned acreage along Oak Creek and invited Michael and Leda to live as caretakers on a uniquely isolated riparian section of property. For 28 years, Michael built these structures with the help of his wife and friends. 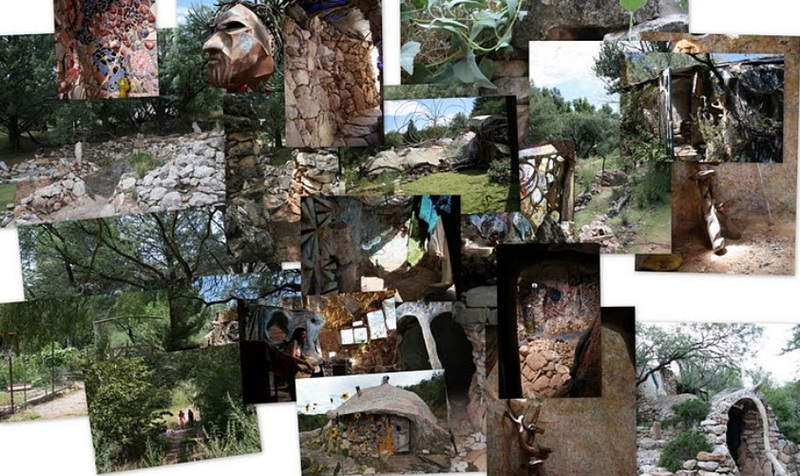 His work seems more shamanic than artistic as his methodology defied convention. Michael never explained his creation, it just is. The most significant of his sculptural work is the half subterranean structures of Eliphante the first experimental building, Pipedreams, the art gallery, and Hippadome, where the couple lived. In between the buildings, stone paths cut through a natural, yet sculpted environment. Any possible insights from those who knew him elude the logical mind. During their years creating Eliphante, it was a magical environment full of spontaneous social interaction that left the most endearing and unforgettable memories for those involved with it. The art and spirit of this place has drawn enough attention and interest that it has been written about and photographed for publication in The New York Times, Arizona Highways, The Arizona Republic and The Noise (Saving Eliphante, by Ellen Jo Roberts). Since Michael passed on in 2007, it is the mission of Eliphante, Ltd. – a 501(c)(3) non-profit organization, that his fantasy be shared, to inspire a new beginning, where the realm of pure imagination and possibility may open the door to future dreaming by visitors and residents alike.